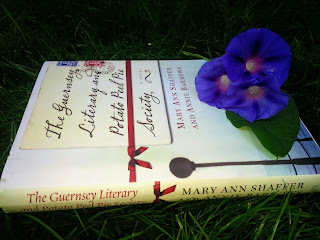 The Guernsey Literary and Potato Peel Pie Society by Mary Ann Shaffer and Annie Barrows immediately shot up to my list of favorites. Newspaper columnist, Juliet Ashton, receives a letter from a stranger on Guernsey Island in the English Channel in 1946. Dawsey Adams finds Juliet’s name on the inside of a book and writes her asking if she could send him the name and address of the bookshop in London were the book came from. He explains how the Guernsey Literary and Potato Peel Pie Society came into being because of the “roast pig” in the book and therefore he feels a kinship to the author. This, of course, piques Juliet’s (and my) interest in the unusually titled club. Juliet begins a regular correspondence with Dawsey and other members of the society where she learns about their lives and the recent German occupation during WWII. Written with warmth and humor in a series of letters we discover pig farmers, phrenologists, and survivors of the German occupation. This is a fun book that I seemed to smile my way through. I was interested in each of the islander’s backgrounds. It also made me want to know more about the history of this island that I had never heard of. My book club gave it an emphatic thumbs-up. Even with the sad subject matter of the atrocities of war and the hardships everyone endured, it was not a depressing book. It was light-hearted with a couple of rough spots—in my opinion “a must read.” So, get in the mood with a “Long Island iced tea,” potato skins, and sweet potato pie as our book club hostess did. Then sit back and enjoy! He could talk an angel out of Heaven…. (about Dawsey) Mary Ann Shaffer and Annie Barrows, The Guernsey Literary and Potato Peel Pie Society (New York: The Dial Press, 2008), 202. Reading good books ruins you for enjoying bad ones. (Isolda) Mary Ann Shaffer and Annie Barrows, The Guernsey Literary and Potato Peel Pie Society (New York: The Dial Press, 2008), 53. Your questions regarding that gentleman are very delicate, very subtle, very much like being smacked in the head with a mallet. (Juliet to Sophie) Mary Ann Shaffer and Annie Barrows, The Guernsey Literary and Potato Peel Pie Society (New York: The Dial Press, 2008), 85. This is a must-read, and one that any bibliophile will delight in. It's gotten rave reviews, and I can happily say that this is worth it to find, whether you find it in your local library or purchase it for yourself. As to my copy, it's going straight to my 'keeper' shelf. Thanks for the comment. I totally agree. I loved this book!